COLOR- LIGHT GREEN, Size : 36 x 40 x 42 Cm Height. Weight - 5.6 Kg. HAND WATER SPRAY GUN IS A STANDARD SUPPLY WITH THIS PRODUCT. Material: H.D.P.E. (High Density Polyethylene). Weight Bearing Capacity- 120 Kg. Water Tank Capacity - 12 Lit., Waste Collection Sump Capacity-20 Lit. 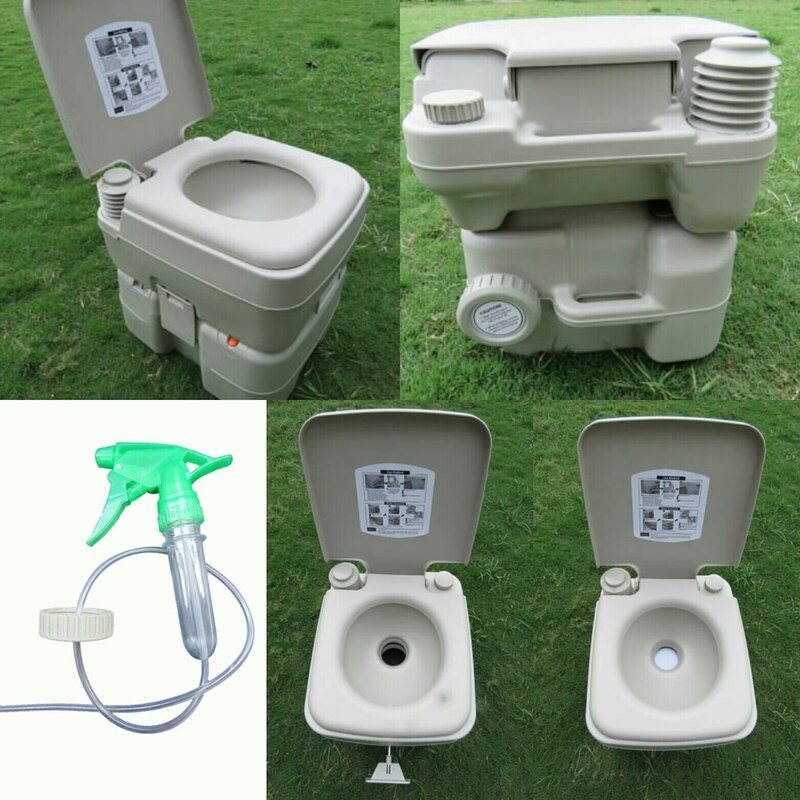 PROVIDED WITH WASTE LEVEL INDICATOR & VENT PLUNGER (FOR SPILL CONTROL) Very light weight product for easy portability. Supplied with required chemicals kit to lower odor, keep tub surface smooth and non sticky, as well as to convert collected waste fragmented for easy discharge Facilities : Top seat and water tank can be separated from bottom sump releasing side snap type brackets for cleaning. Discharge of collected waste can be carried out through large drain passage opening a threaded cap at the back side. Flush water can be obtained by repeatedly pressing a rubber bellow. Bad odor can be restricted closing sliding gate, when toilet is not in use. Design Construction : Integrated seat and water tank having capacity of 12 lit.. , Water can be filled from top through inlet passage provided with cap. Waste is collected at the bottom in a septic tank/Sump. Septic tank can be discharged though outlet passage by opening a cap. Septic tank can also be cleaned by splitting apart upper and lower part clicking side snap type brackets. Water discharge outlet provided within the tub. Push-pull arrangement provided to open and close potty hole to restrict odor emission. Top tilting seat cover flap provided for tub. SIZE : 36 cm x 42 cm x 40 Cm Ht. WEIGHT- 6 Kg. Features : Can easily be carried while travelling. Very light weigh for easy handling. Strong enough to take weight up to 120 kg. SPECIAL INSTRUCTIONS : Return of this product is not accepted by the seller unless it is found defective by the buyer while taking delivery and/or if the product is not as per its description on website. Such discrepancy is to be reported along with proof of the same within 24 Hrs. after delivery of the product .